Much of the details of last week’s agreement between the Big 12 and outgoing schools Nebraska and Colorado came out. Dan Beebe talked about why Nebraska has to pay $9 million and Colorado has to pay $6 million. Also, don’t look for expansion anytime soon. They haven’t decided on how to divvy out the cash, but chances are it will be the same formula used for the revenue sharing in general. Irish eyes will be smiling when Notre Dame will play Navy in Ireland 2012. We’re not sure where they will play but more than likely there’s a good chance they’ll all go out together after the game and get drunk. In preparation for last week’s game against Boise State, Oregon State coaches had their practice field painted blue. That’s some great thinking there. It’s almost like using loud speakers to emulate crowd noise except messier. Communication issues have tormented Turner Gill and the Kansas Jayhawks. His solution? Yanking cell phones from players the day before the game and then giving it back in the locker room after the game. How will the players wake up in the morning or talk to their mothers? I guess that’s what computers are for. We wonder how many more losses it will take for Gill to yank computer privileges too. The NCAA leaped to action regarding the issue of sports agents and collegiate players by writing a letter. A letter. They asked for cooperation. Nothing else. Just another reason the NCAA needs to upgrayedd or just disband. These guys are getting real irrelevant. The Playoff PAC, the special interest group formed to blow away the BCS and instill a college football playoff, will file a complaint with the IRS regarding the tax status of the Fiesta, Sugar, and Orange Bowl. They used a load of lawyers and one accountant to pick apart the tax returns and public documents of the BCS bowls and found that some loans and director salaries were just too much. Whether the IRS will remove the tax status, we won’t know. But we do know that the Playoff PAC is digging into every crook and cranny to blow away the BCS. Meanwhile, the PAC 10 is thinking about having their title game in Las Vegas. Okay that’s a little crazy as there is no team in the Pac 10 from Nevada. It is centrally located, but they need to have it in California. Texas is signing up another (somewhat) tough opponent in Maryland for the 2017 and 2018 season. Will this be the game on the Longhorns Network? Because of past troubles, USC will be barred from playing the Pac 10 Championship Game in 2012, if they are good enough to get there. Bide your time Trojan fans. Once Lane Kiffin blows up your program and you rebuild, you’ll be able to enjoy the fruits of the title game. It seems Landry Jones of Oklahoma will have a higher calling after he is done calling plays. Jones says he’s 98% sure that he wants to become a pastor after football. Just goes to show you all walks of life come to play football. We wonder how many Hail Marys he’s tossed compared how many he’s recited. He’s just hanging with Tim Brewster. He’s not going for the head coaching job. That’s what Minnesota is saying after Mark Mangino was spotted on the sidelines of a game, supporting his buddy. Minnesota should’ve gotten right out in front of this. There is no way no one would not recognize Mark Mangino hanging out on the sidelines. The nose bleeder seats would’ve been able to see him. Apparently along with the no cell phone rule for players, Turner Gill’s Kansas Jayhawks can’t be with the ladies after 10 pm. That’s a harsh rule. It’s on any night. Do mothers count? Like as in visit and talk to. Keep your mind out of the gutters, people. Nick Saban said his Alabama team should be set to face Michigan in the Jerry Jones Super Mega Cowboys Stadium Dome in 2012. It sounds like more college games will be played there than pro games. It’s good for Dallas we suppose. Looks like Kansas backup, and former starter, Kale Pick will be out a couple of weeks with a leg injury. Not sure if he will ever see a snap again. 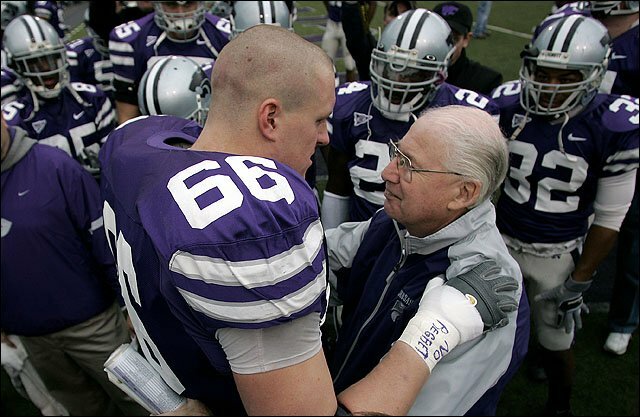 Bill Snyder 2.0 is starting to look alot like the first version. The Wildcats snagged a top ranked junior college quarterback Justin Tuggle from Blinn, much like another former one by the name of Michael Bishop. This looks to be the next year. The NHL’s Stanley Cup showed up at the Notre Dame game last week. It will be awhile before the Fighting Irish will see another title of any kind down in South Bend. Strange things are afoot for Missouri. First off, cornerback Munir Prince left the team due to the transient quadriplegia he suffered in the preseason. If he plays anymore it could get permanent. Next up, senior safety Jasper Simmons has been suspended indefinitely from the team. He had knee surgery after the Illinois game. Are they just trying to drop a scholarship or something? At any rate, some very unusual things are going down in Columbia.